Every year my husband and I visit the State Fair in Columbia, South Carolina. South Carolina is more of a crop-raising than livestock state, so there are not many cattle, pigs, or goats to grab attention. However, there are chickens, and I love chickens. I don’t know why. Maybe it’s just because they are large, hearty birds that are easy to keep. More likely, it is their endearing eccentric personalities that keep me interested. When our children were young, we had chickens. Actually, I had chickens. Back then, gas stations gave away Easter chicks with a fill-up of gas. 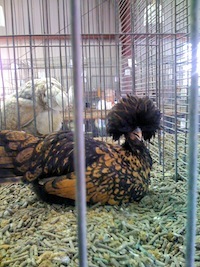 I am convinced these chicks were always roosters. A “friend” brought us his free chick because we lived in the country. Our girls were enthralled by this little bit of fuzz. When he grew into the expected rooster, I bought a few pullets (young hens) to keep him company. Turns out the girls’ love affair with the rooster was not a forever thing. I never knew until just a few years ago that my children hated my chickens. For me, going into the hen house, talking with “the girls,” and discovering eggs to tote back to the house was amazing. It turns out, to my children, it was a horrific experience. Hens pecked young fingers when they tried to extract the eggs from the occupied nest. When they went after the eggs, the rooster went after them. He was my pet. He would sit on my arm. I had no idea he ruled my family as well as the roost. My children dutifully gathered the eggs and never ratted on my much-loved bully of a rooster. So, if you want a peaceful flock and happy children, do not get a rooster. Three to five hens will give you plenty of egg-laying power and insect scavenging in a city garden. Just like vegetable gardening, when you raise your own eggs, you have the satisfaction of knowing that your chickens are well cared for and the hens build eggs from nutritious forage and feed that you supply, free of chemicals. The first thing you must do before you install chickens in your yard is check the local zoning rules. Many cities now are relaxing their rules so that their populace can have the benefit of backyard chickens. Roosters are usually taboo in cities and suburbs, just because of their penchant for early morning crowing. Even if they are allowed, your neighbors (and your children) will thank you for not bringing a rooster into the neighborhood. Hens lay eggs whether or not there is a rooster present. The eggs will just be sterile so your hens won’t be able to hatch any chicks. Hens will still have that “mother” instinct and try to set on eggs. So, you will have to keep the eggs collected from underneath any mother-leaning hen. If you have the room and distance from neighbors, and want a flock of chickens with a rooster, you will be able to let your hens hatch chicks. Back when I was raising chickens, I read that pointed end eggs resulted in roosters and rounded end eggs produced hens. I removed all the pointy end eggs from under my hens and in this unscientific trial my hens hatched all pullets (8), except for two roosters. I don’t know what the normal ratio is, so this might just be a perfectly normal hatch even without the pointy end removal. The next thing you must do is protect your little flock from predation. They should be in a moveable pen with a covered top and a floor of wire. This way you can move your biddies around the garden and still keep them safe. Many folks know to put their free-range chickens in a closed shed at night, but we have hawks visiting our garden, especially now during migration, so day protection is necessary here and very well could be where you live, too. This Mother Earth News article explains how to build a small, moveable hen enclosure for about $100. 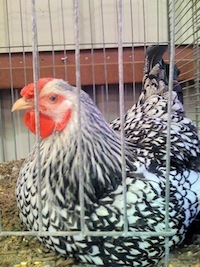 For all kinds of fun photos and chicken facts, visit the Feathersite poultry page. For a free e-book on choosing and caring for chickens, visit the My Pet Chicken website. 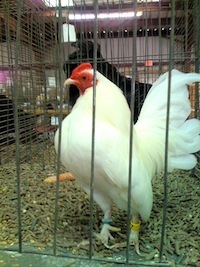 Chickens come in all sizes, from bantam to bulky. They can be colorful, stripey, all black or all white. Some have fancy hats. Some have fancy feet or feathery beards. Some lay white eggs, some brown, and some will even lay colorful Easter eggs. In this day of sustainable gardening, chickens definitely have a place. Not only are eggs useful in the kitchen, the fertilizer is full of nitrogen for your garden. Consider yourself lucky if you have some chickens come home to roost.